I became a foster parent by accident, a happy accident. A little about myself: I am a special needs teacher in Austin. I’m single, have no biological kids, and worked a part-time job in my spare time. had no language and was alone and scared that she had no one who would advocate for her and scared for myself that if I didn’t do anything to help her that I wouldn’t be able to live with myself. I spoke to CPS that day and asked what I needed to do to bring her home with me. She had been placed in a temporary living dormitory under a watchful eye but it was not a home. CPS referred me to a foster agency. I spoke to them to begin the process of becoming a foster parent. I expedited the process as much as I could so that I could bring her home. I was full of anxiety and fear about her well-being. Since she was a child with special needs there were extra classes I had to complete. I took off work to complete the required classes and go to court. At first I was afraid that someone would get her before I could complete the my application. As the case proceeded, I realized I was her only option. I went to visit with her as often as I could. She would smile when I walked into the room. Finally, after 30 days, I received my foster care license. Then I had a phone conference with doctors, case workers, and CPS which resulted in an agreement for her to come home with me. The first night, CPS, the foster care case manager, and myself met where she was housed and I signed all the paperwork. We left to go home with a stop on the way for dinner and to pick up medicine. It was 9:00 p.m. before we made it the house where CPS had to come and check in on her. We ate, gave meds, and went to bed. I don’t think I even slept that first night and very much the first month. But with each passing day, our schedule got worked out and I finally felt like a bona fide foster parent to this adorable nine-year-old little girl. I was introduced to Austin Angels through a referral from another advocate group to help me with clothing. I met my Love Box leaders and my case manager Kathleen, at Starbucks. Kathleen interviewed me to find out our interests and needs. Love Box leaders are volunteers who want to help kids in foster case. They donate time to spend with a paired foster family and they also put together a monthly Love Box of goodies for their family. We have met at the park and each others’ houses. They have even come over to fix a few of things at my house. THEY ARE AMAZING! 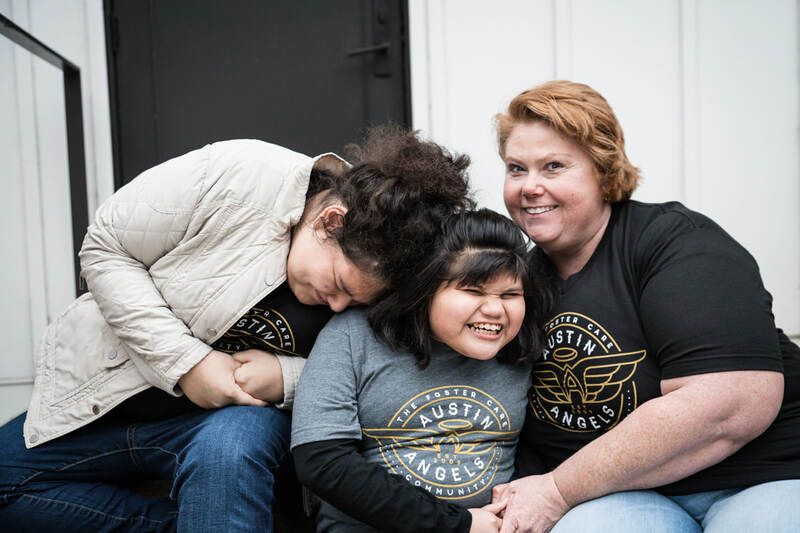 Additionally, Austin Angels also connected us with KINGS (Kids In a New Groove, music lessons), parent's day out events, overnight camping at Camp Glimmer, activity passes for the summer, and a bountiful basket of activities and goodies for Christmas. They have and continue to provide a community of caring, friendly faces and resources that I, as foster parent, would have never dreamed was possible or existed.